The Enron Debacle, 14 years Ago—2015 Lessons for Nonprofit Boards? In 2001 Enron Energy collapsed due to financial manipulations and a moribund board. It was the seventh-largest company in the United States. Andrew Fastow, the former CFO and architect of the manipulations served more than five years in prison for securities fraud. He recently offered the following comments to business board members that, in my opinion, are currently relevant to nonprofit boards. (http://bit.ly/1JFGQ6T) Quotations from the article are italicized. Nonprofits directors and managers can find themselves in similar situations. One obvious parallel is when a conflict of interest occurs. A recent a recent court case documented instances in which a nonprofit ED approved insurance premium payments for the nonprofit to a friendly insurance agent. The agent in turn provided kickbacks to the ED, worth millions, a well-respected person in the human services field. Board members and managers themselves can be at financial peril if they wittingly or unwittingly provide an excess salary benefit to an employee or an excess benefit to a volunteer or donor. Examples: The board allows an above market salary to offer to the CEO. Also the board allows a parcel of property to be sold to a volunteer or donor at below market values. One subtle area of decision-making morality centers on whether a board’s decision is immoral by commission or omission. Examples: In its normal course of client duties, the board allows managers to travel by first class air travel. Obviously, resources that are needed by clients are being wasted and morally indefensible. On the other hand the moral issue can come in to play, if the nonprofit is husbanding resources well beyond what is needed for an emergency reserve. The organization, in a sense, is not being all it can be in terms of client services or in seeking additional resources. Overly conservative financial planning, not unusual in nonprofit environments, can result in this latter subtle omission “moral” dilemma. Overtly, universities with billions of dollars on their balance sheets have been highlighted as having the issue, but I have occasionally noted smaller nonprofits in the same category. •	He (Fastow) said he ultimately rationalized that he was following the rules, even if he was operating in the grey zones (area). There can be grey zones for nonprofits. Example: IRS rules require that the nonprofit board be involved in the development of the annual Form 990 report. But what does this involvement mean—a brisk overview when the report is finished, a serious discussion of the answers to the 38 questions related to corporate governance, a record in the board minutes covering questions raised and changes suggested, etc.? 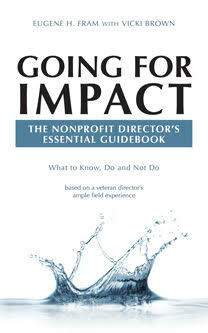 A nonprofit boards needs to make a determination on which course is appropriate. Boards implementing government-sponsored contracts can get into grey areas. Example: Some contracts require the nonprofits to follow government guidelines for travel expenses. I wonder how many nonprofit audit committees are aware of their responsibilities to make certain these guidelines are followed? As Fastow did, human service boards can invite trouble if they falsely rationalize an action as being taken for client welfare, and then conclude they are following the rules. •	Mr. Fastow said one way to start changing an entrenched culture is to have either a director on the board, or a hired adviser to the board, whose role is to question and challenge decisions. Nonprofit directors are often recruited from friends, family members and business colleagues, etc. This process creates an entrenched board. An old Chinese proverb states, “A wise man learns by his own experiences, the wiser man learns from the experiences of others. Nonprofit can learn a something from Andrew Fastow’s post conviction recollections to hopefully help avoid signifcnat debacles.